Sunday is typically the day where the Oracle development team is on stage to talk about what they do, give insight in the product etc. - for me personally one of the highlights of the conference. Joel demoed HTML DB 1.6 again, the predecessor of APEX - went live in 2004, so 10 years ago (time goes fast!). Next he timed doing development in APEX 4.2 compared to APEX 5.0. Conclusion: APEX 5.0 is more productive, efficient, intuitive, modern and easy. Joel highlighted the other new features in APEX 5.0, most of them I already blogged about or you find them here. Patrick showed the time it takes to build components and items in previous versions of APEX. 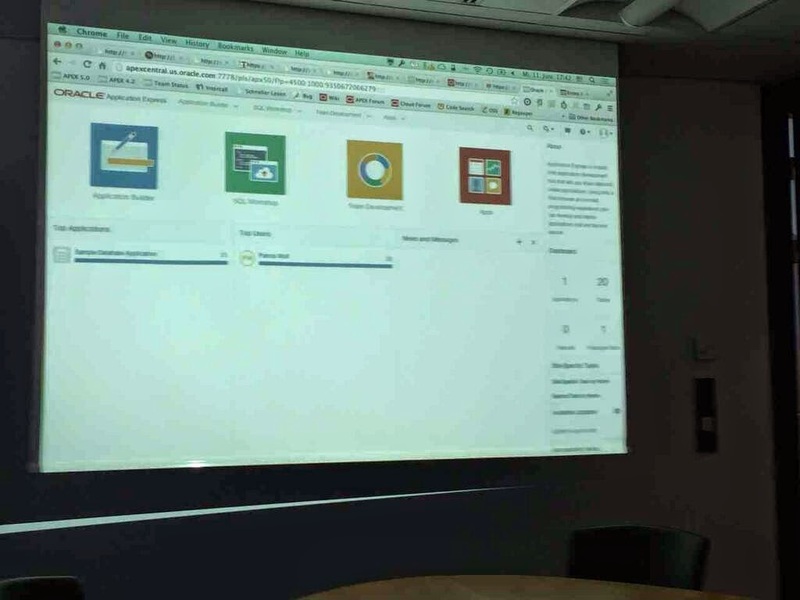 Next he compared it to how you do things with the new Page Designer in APEX 5.0. 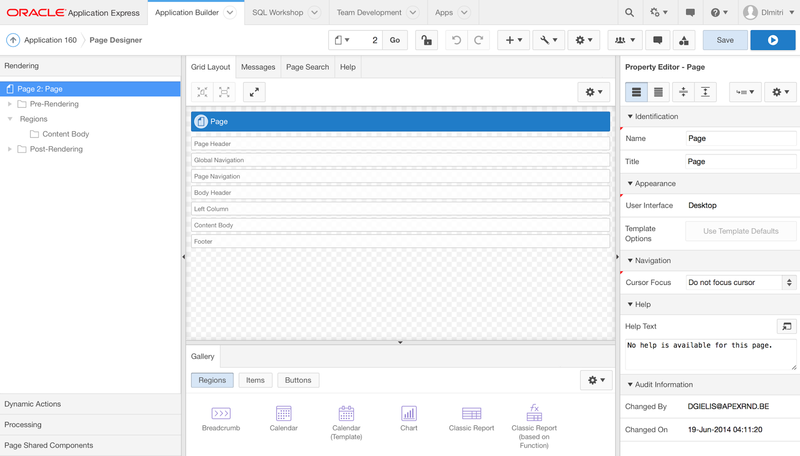 There're so many new features in the Page Designer, just give it a try to explore them. It will take a bit of time to get used to them, but it will be the future. APEX uses jQuery Mobile behind the scenes. APEX 5.0 includes the latest version (jQuery Mobile 1.4). The philosophy is to create "mobile first" applications. APEX 5.0 will include a new mobile theme, which support the new jQuery Mobile swatches. It's very easy to use ThemeRoller to create your own swatch and upload the zip in Shared Components in APEX and add a style to the theme and make it active. There are many more new features in APEX 5.0 for mobile development like for example a new region type called "Reflow table". 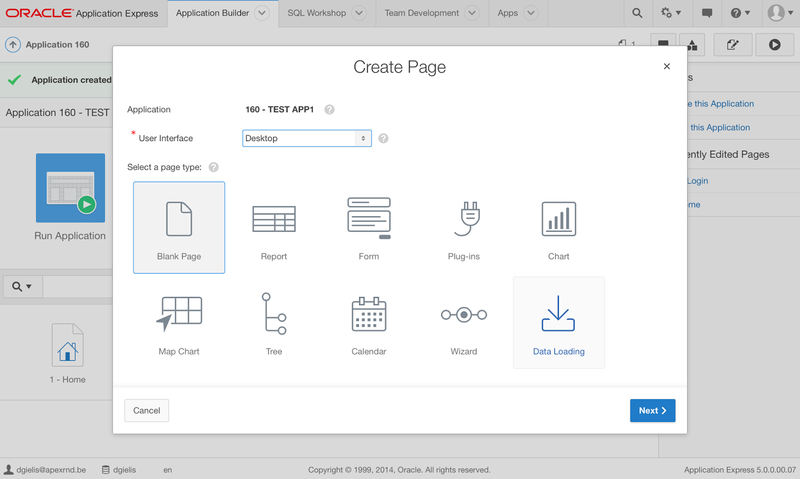 In APEX 5.0 you (can) develop in the new Page Designer. The Page Designer makes you way more productive, less clicks and quicker results. You have to get used to it, and you probably want a big monitor (time to ask your boss! ), but once all that is done - you will love it. The region where the error is, is highlighted. You get a notification message top right in red with the error message and inside the property panel it's highlighted what you need to change. Once you click on the field it will give another text notification e.g. that it is required. There's also the Messages tab which gives you an explanation of what is wrong. Clicking on the link will bring you right where you need to go. But just look at the Page Designer for a while; notice the small top left red triangles; it identifies it's a required field. The "Show Common" and "Show All" tabs are great too. So many things, small, large, ... but so useful. Here's another one - Developer Comments for the page. If there are comments you see a number in the comment icon. When clicking on the icon you can add more comments. I believe it would also be useful to see the existing comments, hopefully that will be in the final release. 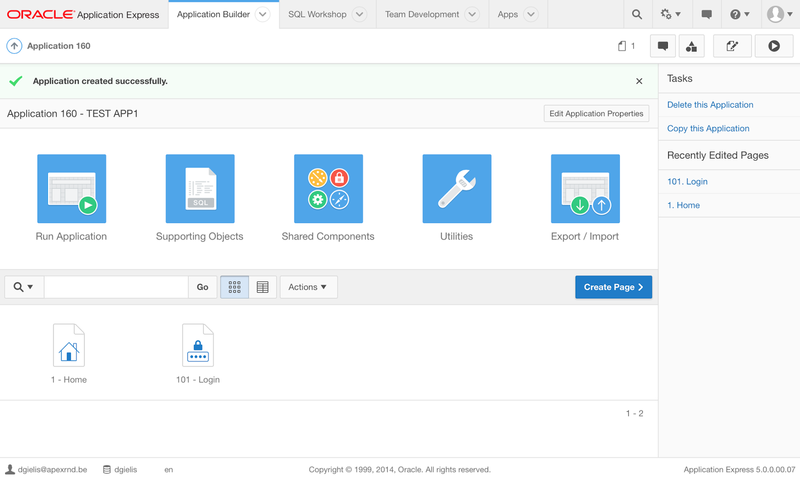 This post is based on Oracle APEX 5.0 EA2, but there's more coming it looks like. Linked to the previous feature, I see a tighter integration with Team Development already too. So many things to explore in the APEX 5.0 Page Designer... definitely worth your time. In the Appearance section you find kinda the same options as in APEX 4.x, but when you look a bit further, there's so much more now. The icons you can chose for your button are based on Font Awesome, a great scalable vector icons library. 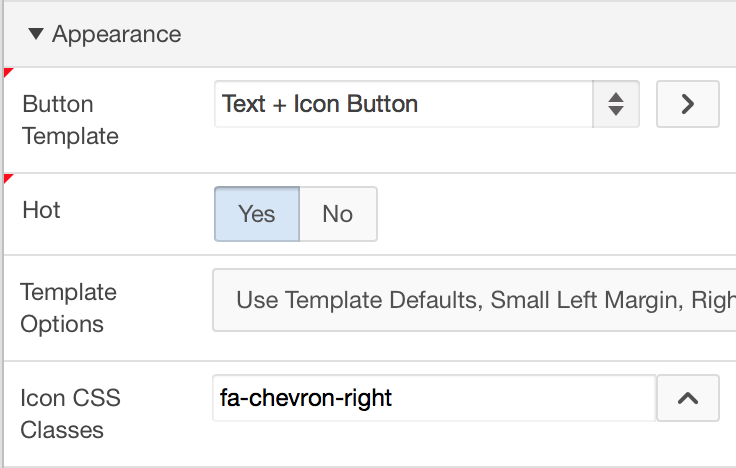 I use Font Awesome in APEX 4.x too, but I had to create a new button template and put the name of the icon in the class section. This is now all integrated and declarative in APEX 5.0. For Mac users like me; the Option key is "alt". For the F1 etc. use "fn". 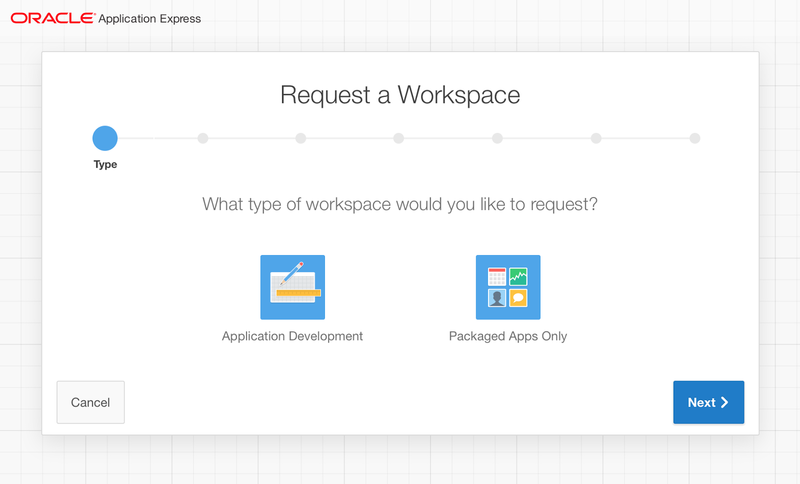 You can now request a workspace in the brand-new version of Oracle APEX 5.0 (EA2). 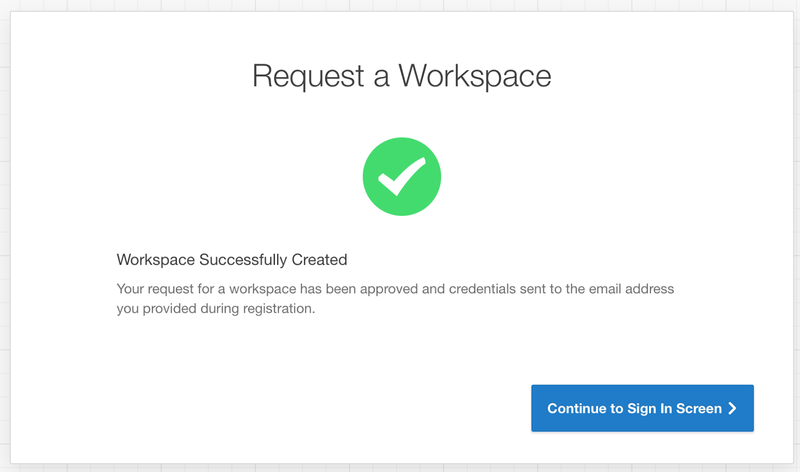 Once requested a workspace you will get an email to activate it - and you're up-and-running! Creating new pages work well and the new universal theme (theme 42) looks nice too. Oracle APEX went flat design, with bright color blue and grey and nice icons (which are available as a font). More to come in other blog posts... have fun! 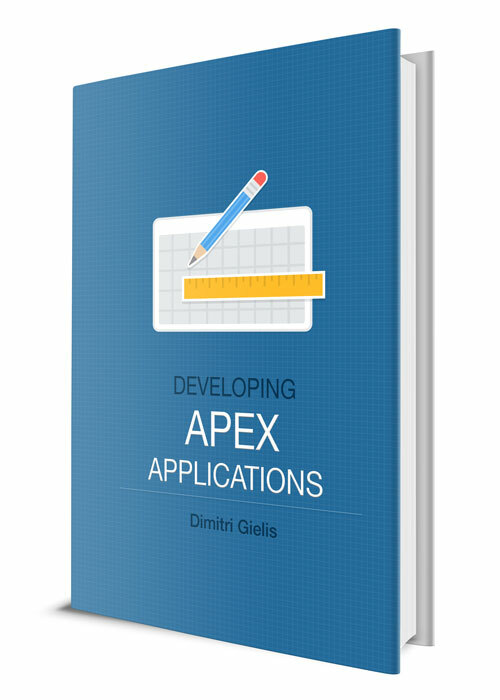 and thanks to the APEX Development team for another great release. 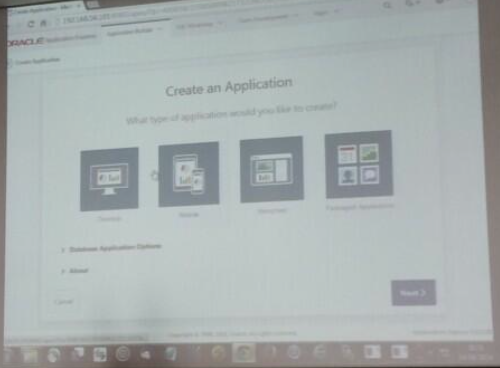 Joel just blogged that the 2nd Early Adopter release of APEX 5.0 is around the corner. I'm sure this new EA will carry many changes and looking at some screenshots it looks awesome. I especially look forward to the new universal theme. Page Designer - New page definition IDE which incoroporates tree controls, drag and drop layout editor, and a property editor. Multiple Interactive Reports – Allow any number of Interactive Reports to be defined on a single page. Modal Dialog - Enhance the ability to declaratively define modal dialogs. Navigation Lists - Ability to define hierarchical lists for navigation, with pull-down menus and sub-menus, instead of being constrained by tabs. 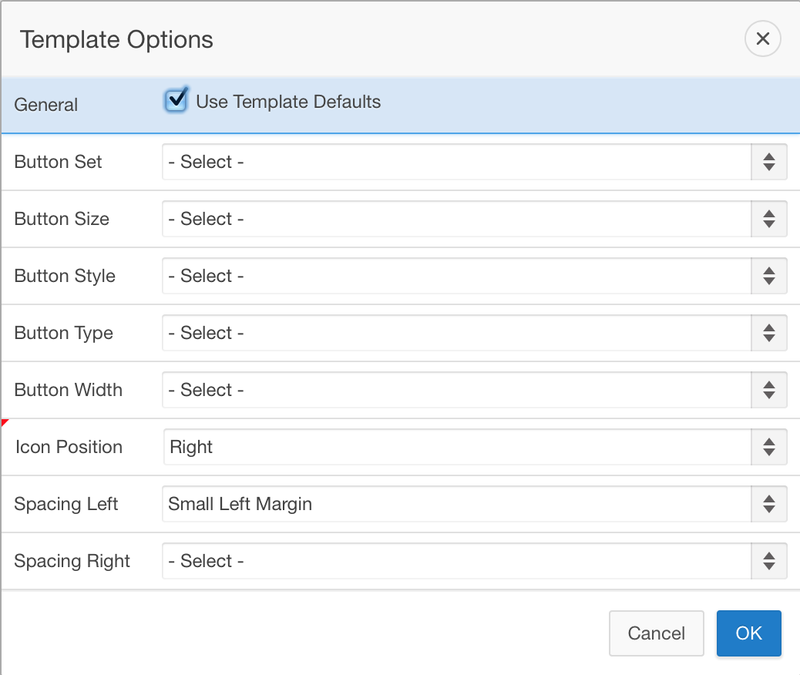 Mobile - Enhanced responsive tables, including reflow tables and column toggles, and introduction of panels. Calendar – New calendar region which allows duration based events, improved functionality, and better control over drag and drop operations. Universal Theme – A new central theme which readily allows developers to customize simply using CSS. HTML5 Capabilities – Improve native capabilities for handling HTML5 constructs. 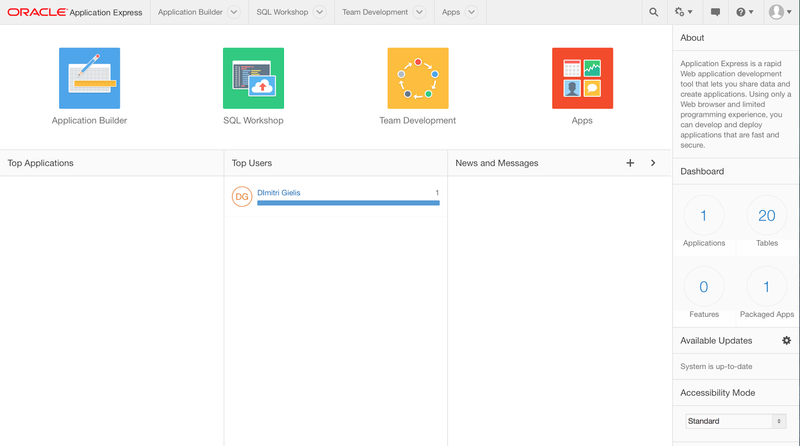 Application Builder Security – Allow different authentication schemes to be used to control developer access to the Application Builder. For the first Oracle APEX Cookbook I was involved as a reviewer. Michel and Marcel updated their book end of last year, but I didn't take the time to blog about it yet - and months fly. The concept stayed the same as the first edition, but it got updated with the latest info for APEX 4.x. "People who followed a beginner training or learned APEX at their own and they want to know how to do a specific thing which is covered in the book, it's great to have the book, as you can just follow what the authors wrote and you also have an idea why it's done like that." People expect these days from a public website you can authenticate with Facebook, Google+, Linkedin, Microsoft etc. It's very convenient as you don't need to create a specific account per website. All of the social networks have very good documentation how to call their APIs. Here's for example the Facebook Login explained. 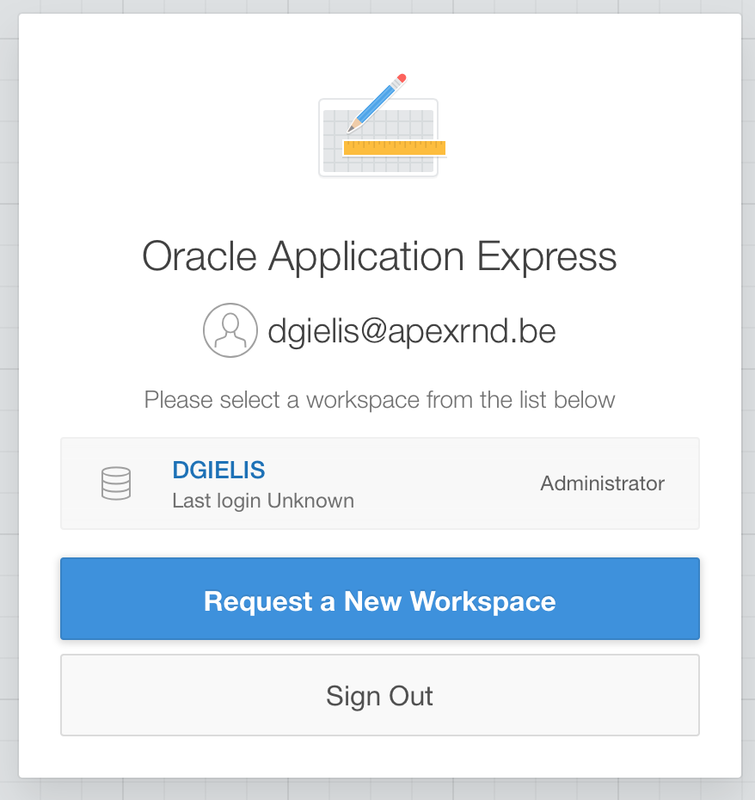 So how easy is it in Oracle Application Express (APEX) to do such social authentication? Unfortunately Oracle APEX doesn't provide us with a native social authentication mechanism just yet. But nothing prevents you from building it yourself. Custom build; in PL/SQL you call the different url's and make some procedures public so when the social network comes back you can intercept the call and move on. 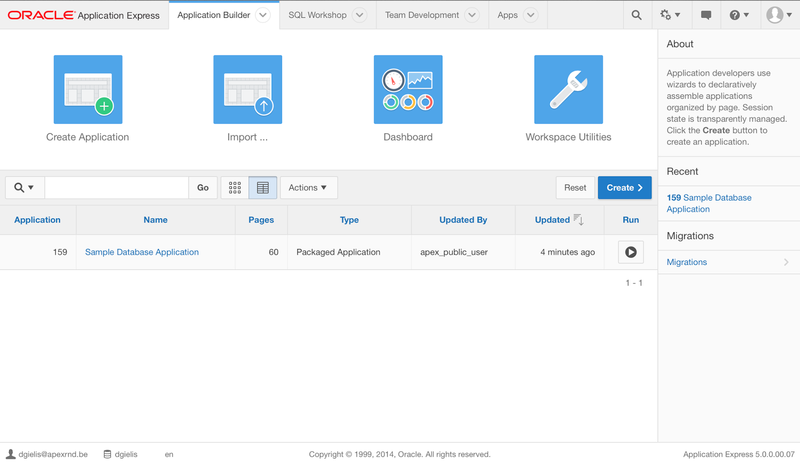 Oracle REST Data Services supports OAuth 2.0 and the calls are mostly REST calls, so I also looked into writing the logic in ORDS (and PL/SQL) and integrate that way with my APEX application. Some people in the community wrote an authentication plugin which does the hard work for you. I went with a combination of the Facebook plugin in combination with my own PL/SQL code. Peter was so nice to share his work with me, thanks again for that Peter. I first thought that the authentication plugin would be plug-and-play, just like the other APEX plugins... but that is not the case. It hasn't much to do the way Peter's team implemented it, it has more to do with the complex setup of SSL certificates etc. So when downloading the plugin, know that it will take some time to configure it. Luckily Peter provides good documentation so it makes it a bit easier. 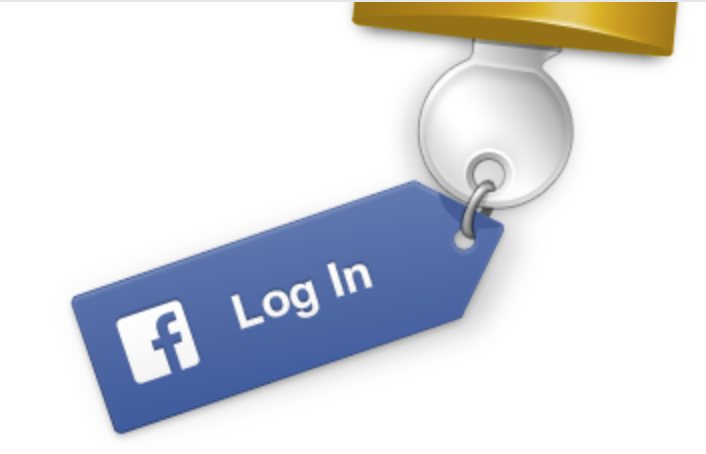 So, to see the authentication to work, login with your Facebook account on the wc2014challenge.com site. I extended the plugin a bit so it will automatically create a site account for you behind the scenes so regardless if you create a site account or login with Facebook it can hook up the scores, bets etc. in the same way. If you want to provide Facebook, Google+, LinkedIn and a normal site account in your app, I found some challenges with that. How do you hook-up a person that logs-in with Facebook the first time, with the same player logging in with Google+ the same time? You could use the email address maybe? But what if they use different ones? There are many blog posts about this topic and how to get around it, but it would bring me to far in this post. I might do a follow-up post later as it's an interesting challenge. I really believe that most public sites will allow social authentication, so I hope the team of ORDS or the APEX development team will make something available to do the social authentication natively in the future. I believe that would be the best solution (fast to implement and secure). 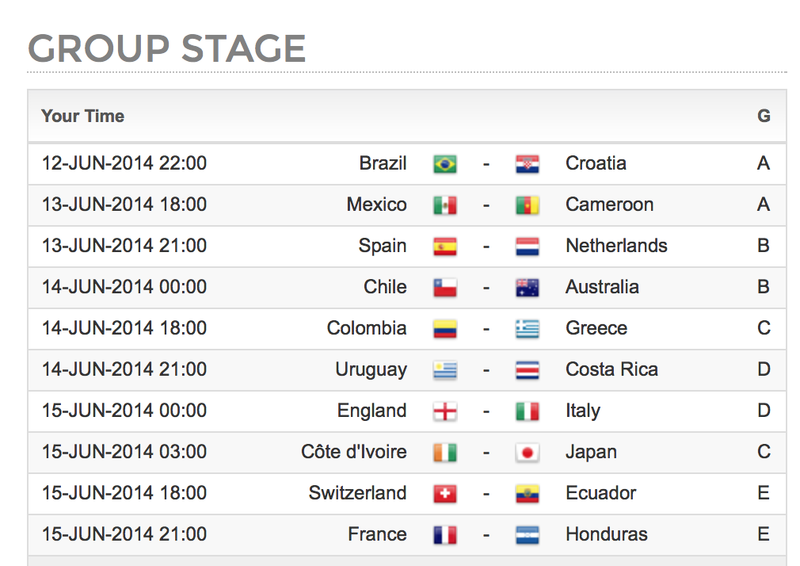 A few weeks ago I asked my friends at RecX to do a security audit of the World Cup 2014 Challenge app. The result was a security assessment document which explained what they tested, an explanation why it was important and the results they found. I found it very interesting to see how other (security) people approach your code. You can read more about security in their Hands-On Oracle Application Express Security book. How do you show to people in different timezones the schedule in their own time? That is the issue I had when building the wc2014challenge.com site. But as you might think, people started to ask to see the schedule in their own time. In previous years I solved the issue by adding a select list, so people could select the timezone they wanted to see the game in. Behind the scenes I reran the query and added the offset to the time - that worked just fine. Now the challenge this year is that the Brazilian timezone exist out of two timezones, so I couldn't really use the mechanism of before. 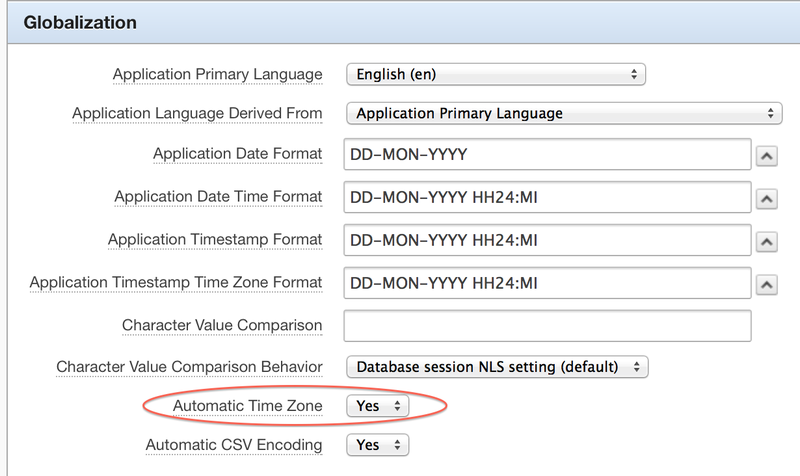 In the Oracle database, instead of a date column, you can use a timestamp with timezone column and can better calculate the difference. Another way is to use the "timestamp with local timezone", so you see the data in your timezone (after alter session set time_zone = your timezone). Instead of doing the timezone conversion, I also thought of doing it on the client (browser), with momentjs for example. They all have advantages and disadvantages... but at the end I decided to use the native APEX way. 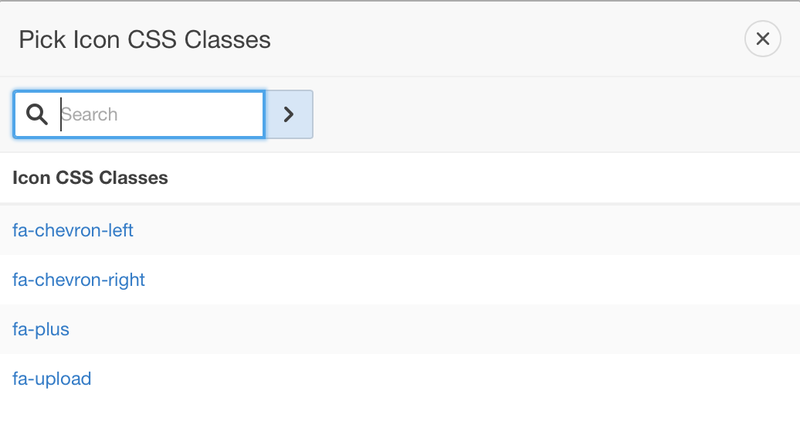 Step 2: set Automatic Time Zone to Yes in "Edit Globalization Attributes" (Edit definition of your app). Looking at the schedule it shows the times in my timezone, automatically. The nice thing is that this is cross application, so the calendar automatically shows the times in your timezone too. Very, very nice - no additional code. So it's very easy to make your APEX application time zone aware... the only drawback I find is that this solution requires a redirect the first time you hit the site. That is not really good for Google rankings, but the advantages weight way more than that for now. You can also read Joel's blog about automatic time zone in APEX 4.0, he build another example which you can follow.